A novel cold-adapted lipolytic enzyme gene, est97, was identified from a high Arctic intertidal zone sediment metagenomic library. 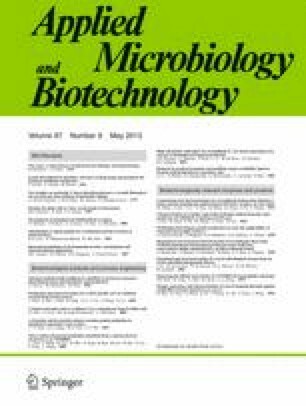 The deduced amino acid sequence of Est97 showed low similarity with other lipolytic enzymes, the maximum being 30 % identity with a putative lipase from Vibrio caribbenthicus. Common features of lipolytic enzymes, such as the GXSXG sequence motif, were detected. The gene product was over-expressed in Escherichia coli and purified. The recombinant Est97 (rEst97) hydrolysed various ρ-nitrophenyl esters with the best substrate being ρ-nitrophenyl hexanoate (K m and k cat of 39 μM and 25.8 s−1, respectively). This esterase activity of rEst97 was optimal at 35 °C and pH 7.5 and the enzyme was unstable at temperatures above 25 °C. The apparent melting temperature, as determined by differential scanning calorimetry was 39 °C, substantiating Est97 as a cold-adapted esterase. The crystal structure of rEst97 was determined by the single wavelength anomalous dispersion method to 1.6 Å resolution. The protein was found to have a typical α/β-hydrolase fold with Ser144-His226-Asp197 as the catalytic triad. A suggested, relatively short lid domain of rEst97 is composed of residues 80–114, which form an α-helix and a disordered loop. The cold adaptation features seem primarily related to a high number of methionine and glycine residues and flexible loops in the high-resolution structures. The work was supported by grant from The University of Tromsø, the regional marine biotechnology program MABIT and the National Functional Genomics Program (FUGE) of the Research Council of Norway (RCN). Provision of beamtime at ID29 at the ESRF is also gratefully acknowledged. We would like to thank Prof. Pompea Del Vecchio (University of Naples, Naples) and Dr. Concetta De Santi (IBP-CNR, Naples) for their kind help in CD and DSC measurements and helpful discussions.